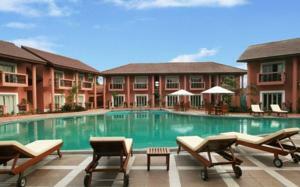 A 10-minute walk from Colva Beach, The Golden Palms Hotel & Spa offers rooms facing the large outdoor pool. It also features a 24-hour front desk, a fitness centre, and a restaurant. Golden Palms Hotel’s air-conditioned rooms are equipped with a safety deposit box, a fridge, and tea/coffee making amenities. The mosaic-tiled private bathrooms have a bathtub and separate shower. Guests can indulge in relaxing massages or relax on sun loungers provided around the pool. Car rental, currency exchange and concierge services are available. Buffet breakfast is served daily. Bamboo Top restaurant serves a variety of Asian and international dishes, with a choice of indoor or outdoor seating. The Golden Palms Hotel is within 6 km from Margao Town and Margao Railway Station. It is 20 km from Dabolim Airport. Wi-fi is available in the entire hotel and costs INR 544 per 24 hours. Free! All children under 5 years stay free of charge when using existing beds. Free! One child under 2 years stays free of charge in a child's cot/crib. One older child or adult is charged INR 1133 per night and person in an extra bed. Maximum capacity of extra beds/children's cots in a room is 1. Any type of extra bed or child's cot/crib is upon request and needs to be confirmed by the hotel. Supplements will not be calculated automatically in the total costs and have to be paid separately in the hotel. Visa, Euro/Mastercard, Diners Club, Maestro The hotel reserves the right to pre-authorise credit cards prior to arrival.